After living in our home for about 4 years (!!!??? Why is time doing this to me?! 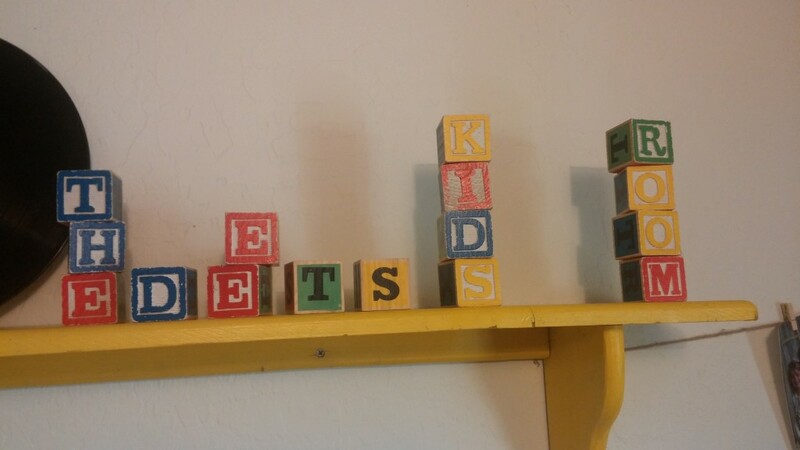 I’m a FAIRLY GOOD person), I finally decorated the kids’ room. I did it with no planning and with stuff I had lying around. This is important. This is important, but I’m not QUITE sure why. I’m slightly concerned, actually. I might have a touch o’ th’ hoarders. Under the name tag on Lacy’s wall I found the words, “I hate Trent” penciled in. I just put that name tag RIGHT back on and covered in my own variety of wall paper. So the hate is double covered. I would have erased it, but I’m out of those Magic Erasers I love so much. 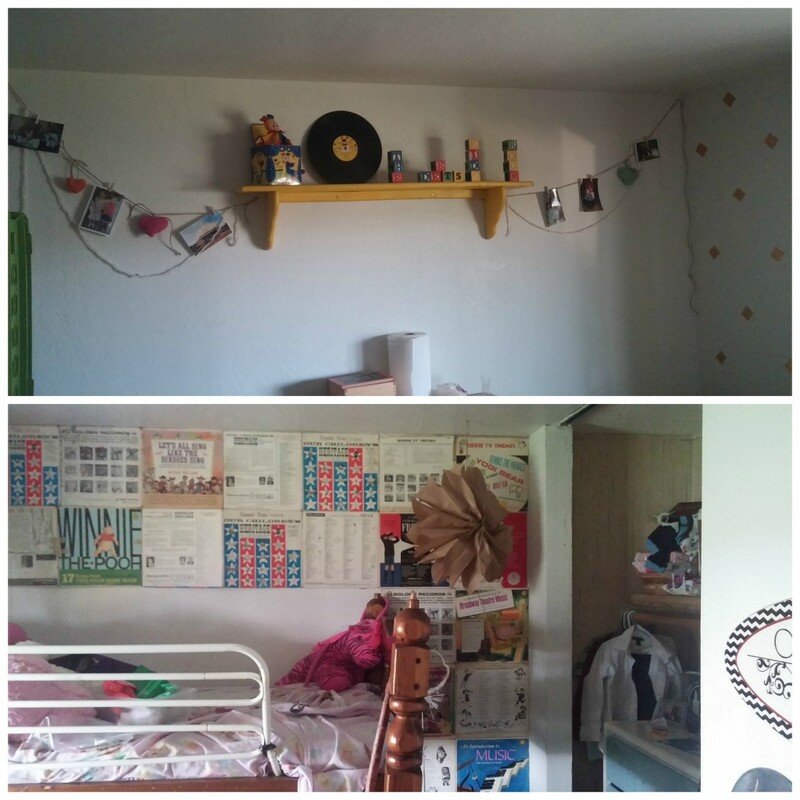 I have a few things to add to the wall with the shelf that aren’t finished yet… but I just happened to have a stack of old children’s record on hand, as well as a shelf and bright yellow spray paint. Seriously. I have THREE cans of spray paint, and one of them is bright yellow. Luck? 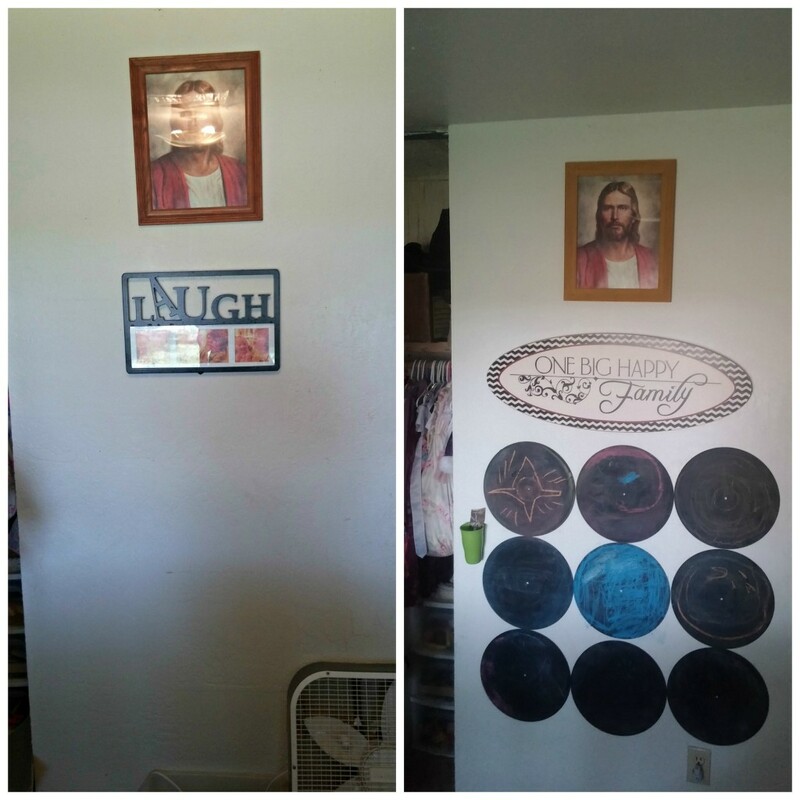 I painted Jesus’ frame and covered the old records in flat black paint and made a chalkboard wall. The kids are in heaven. I nailed a cup to the wall to hold chalk, and it didn’t hold very well… Lacy took matters into her own hands and duck taped it. She knows what’s up. 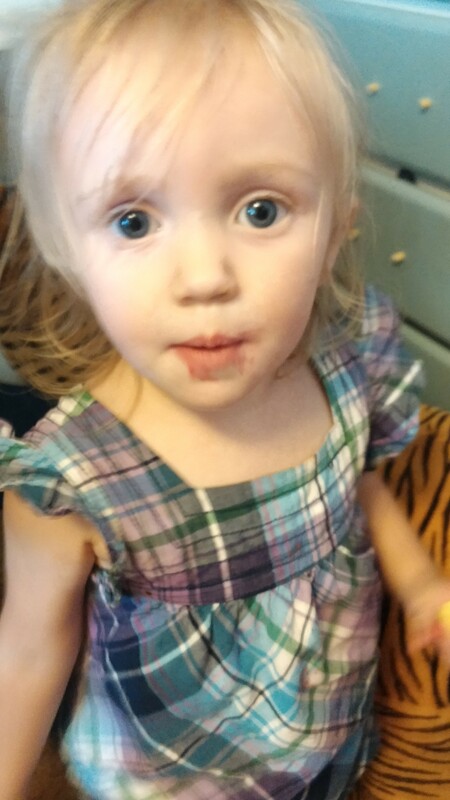 And Alice eats chalk, this we now know. The entry way to their room is now a place for them to hang their church bags… I used a branch I found in my yard and added some nails and some jute twine. 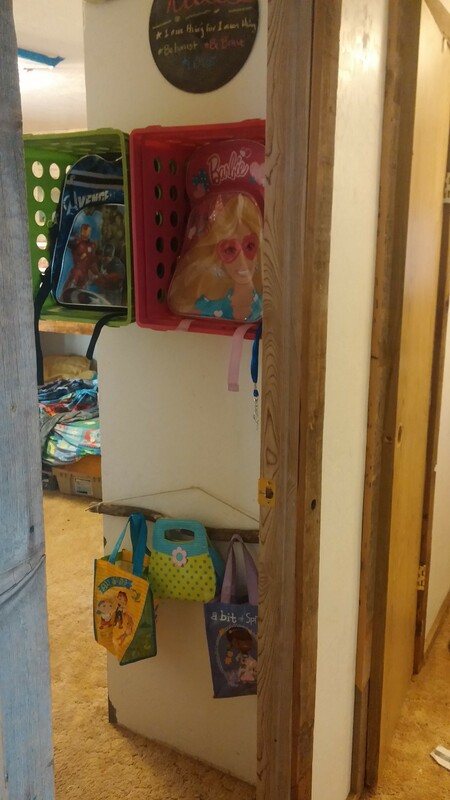 I took some toys in the kids’ bins and relocated them (to the dump… shhhh). 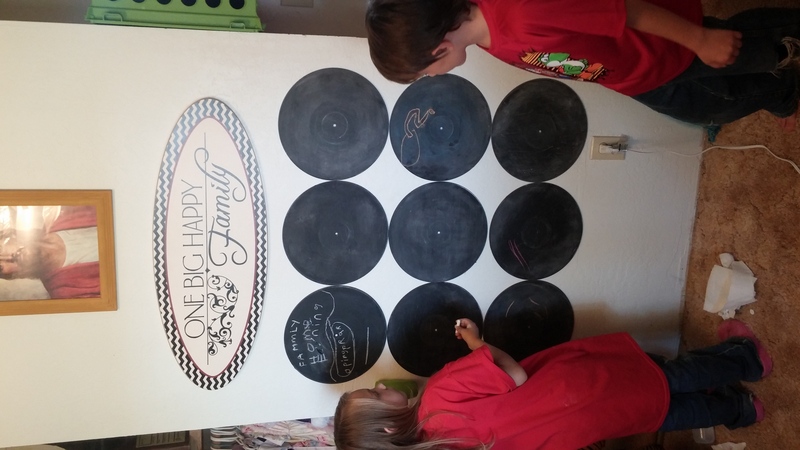 I nailed their bins to the wall to make school cubbies and took an extra chalkboard record to write the rules on. 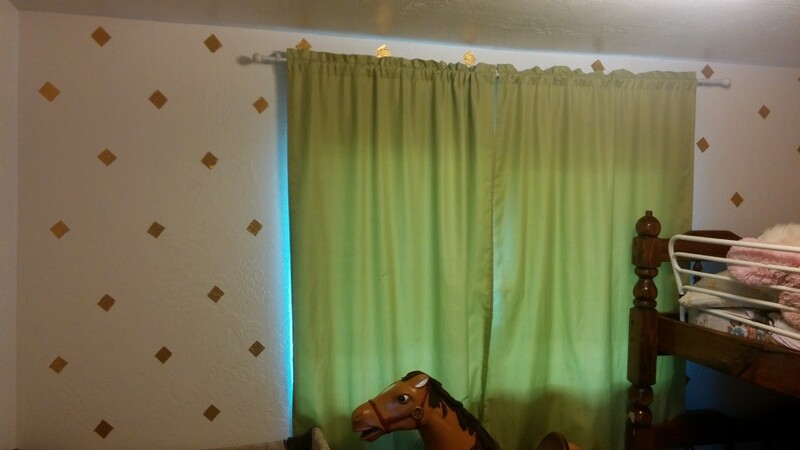 Lastly, I took some gold duck tape, ripped some squares and made gold diamonds on the wall. 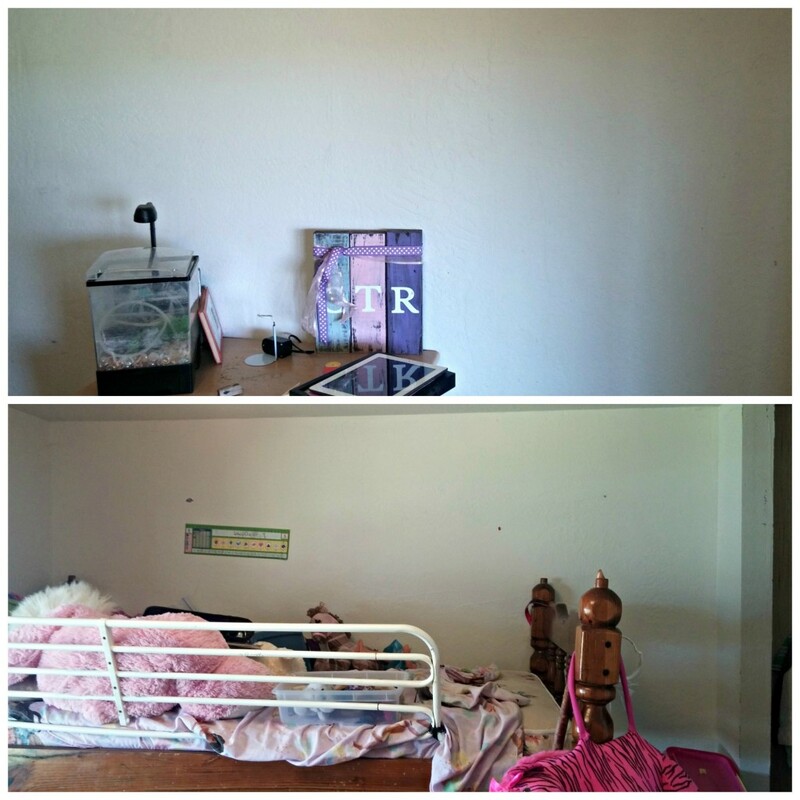 I feel like we can all breathe easier in their room… and not just because we can actually WALK in it now. The kids love it, and I love that I finally did it. Next we’re saving up for new bedding for the kids. They need it badly. I want some solid bright colors… Trenton asked for red and Lacy wants purple. And Alice just wants chalk. 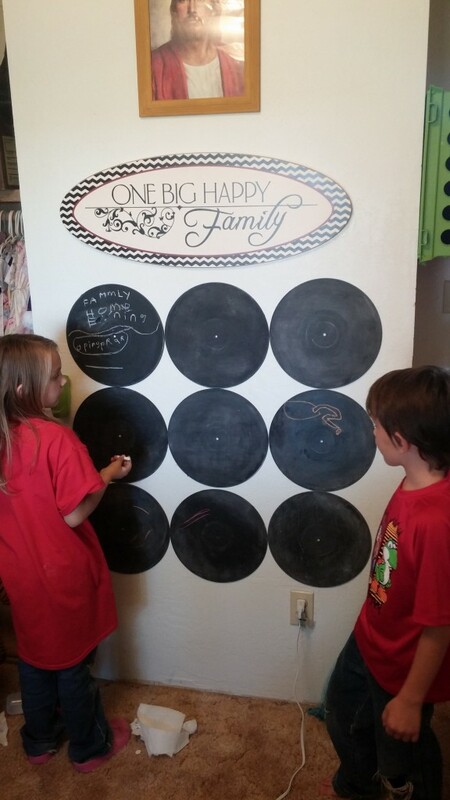 Although I used duck tape to make gold diamonds on the wall, hang old record covers AND old record on the wall, make a big paper flower, and hold up our chalk cup… Duck Tape is not sponsoring me. I’m just a sort of fanatic. Is the red on my neck showing? Yes? Once upon a time, I got an email informing me that I qualified for a free ancestry.com account. I logged in and immediately typed in a name of a relative I’ve been searching for more information on. I didn’t expect any sound results because I’ve been scouring the Internet for YEARS on this person. I’m here to tell you that within a few seconds, I found this person’s father, mother and ALL of his siblings. ALL. And I found spouses of the siblings and those spouses parents! and children! Five hours later I’m forcing myself away from the black hole that binds me. I see that picture, and I need more. I have to have more. Manual needs to be sealed to all 7 of his children. And la! What’s THIS?! I find a deputy! 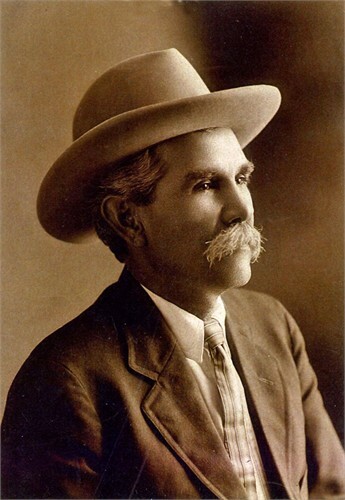 Shot to death while chasin’ down HORSE THIEVES! The baby sleeps, my son shoots me with a plastic arrow. I find a census… the relative I looked years for is RIGHT THERE in beautiful calligraphy. He was a FARMER. Isn’t that amazing? I wonder what he farmed. ORANGES?!?! He lived in California, after all. That’s what they farm there, right? I take screen shots with my phone. Email pictures to myself. Copy, crop, cut, collage. BAM! Proof that he had 5 children. The baby needs a bottle. I finally have to go to the bathroom, and there’s an end of it. But my heart breaks knowing there’s a web of dead people waiting for me to uncover their names and take them to the Temple to be sealed to their families. I’ll be back tomorrow. I need to practice moderation here. Is there a support group for people who seem to have no self-control when it comes to the souls of dead relatives? 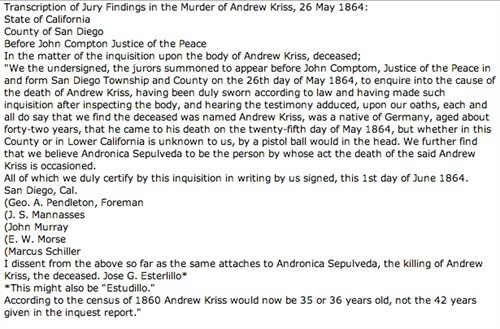 Andrew Kriss, true lawman, your soul is safe with us. And the soul of your daughter and her husband and their kids and their kids’ spouses and their inlaws and the goats and cows and kittens and puppies and rainbows.